Do you think FF should try Performance Capture? You know like mocap and stuff? I mean I've been playing the Uncharted games, and I've noticed there's a lot of emotion, more than most. And in my opinion, it's because of mocap. The english voice actor for Vanille said that each of the actors were in a separate booth and weren't allowed to see each other in a gamespot interview at last year's E3. I think it would be interesting but sometimes when I see motion capture games the motion looks wierd to me. I know that sounds odd but it doesn't seem real at some parts. I could just be retarded though lol. Yeah I guess. Maybe Naughty Dog has it mastered or something. For efficiency's purposes, hell-freaking yes. I mean, the CG and cutscenes in FF13 and FF Versus 13 look phenomenal, but I don't want to think of how much freaking time they spent JUST ON THOSE CUTSCENES trying to animate everything perfectly. With mo-cap, it's all done in one acting scene and then transferred into the game world. Personally I wish Rockstar would license out the technology that lets people do this, but if not, motion-capping would be a good solution to get realistic facial animation and movement animation going on. Reminds me of how poorly Kingdom Hearts' was. Wait KH had mocap? What? I think they should seriously consider this with XV. It could be like the original all over again. No, how poorly Kingdom Hearts' animation was. Oh it just seemed by your wording or whatever that they had done that. I think it would be interesting but sometimes when I see motion capture games the motion looks weird to me. I know that sounds odd but it doesn't seem real at some parts. I could just be retarded though lol. I sometimes think the same thing. I think that it has to do with it being too real though. If I'm playing a game with a fantastical, un-realistic environment and/or slightly un-realistic looking characters and suddenly the characters react and move like a real person would.... it looks strange. For games like Versus, XIII or XIII-2 it would look really good, but try it in Kingdom Hearts and it won't look right at all to me. I think that's why it works so well in Uncharted, everything about the game environment is so true to life that it comes across as believable. They've been doing fine without it right?? If it works out, great. If they continue doing what they're doing that's find too. Well uncharted is the one game that looked wierd to me. I mean its a beautiful game but sometimes the movements seemed to fast or to slow for the given situation. The movements were fluid however. That motion scan technology is ABSOLUTELY AMAZING! And you're right about KH's poor animation. Anyone remember Sora's blank doll face expressions? Uncharted doesn't actually use mocap for the character's faces, just their body movements. I wouldn't mind if Square-Enix did that. But mo-capping the faces would be a major downgrade -- I've never seen that look good in a videogame, and it only looks good in movies when heavily modified by actual animators (eg. Gollum and Davy Jones). And you're right about KH's poor animation. Anyone remember Sora's blank doll face expressions? That's got nothing to do with bad animation and everything to do with system limitations. The "blank doll face" is actually a replaceable texture on a much lower-poly character model. And when they don't use that model, the facial animation is highly expressive and looks a lot better than poorly-applied mo-cap. 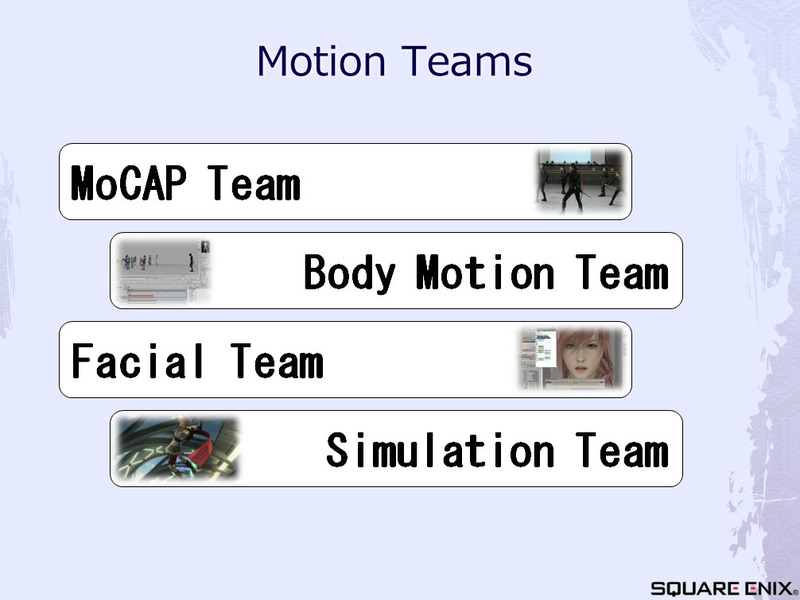 Square-Enix uses motion capture for Final Fantasy games. That bit in your signature is motion capture. In the credits of every game that uses it, they list the people that motion capture each role. They use it for facial animation and dialogue? Oh yeah, you're right. They had cameras that recorded video of the faces for reference, but their amazing facial animation was just credit to the animators. But Square-Enix will take a freaking year to animate an eyelash. Just bodies. Facial animation is done by hand. What do you mean by sinking into one another? lol I'm confused.